Snow Owl supports the creation of local code systems (LCS) . 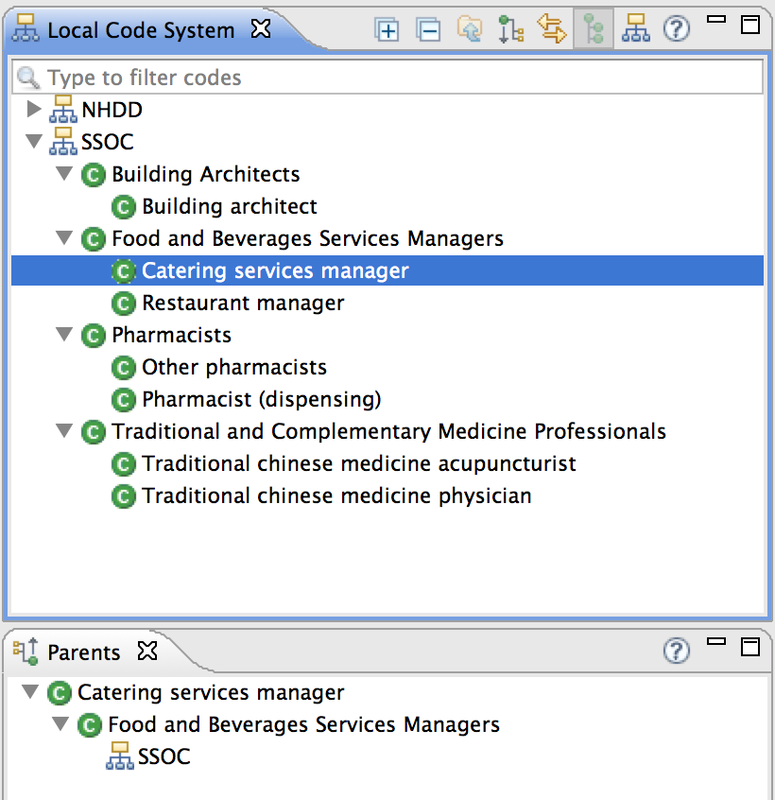 The LCS view (left side of the screenshot) allows you to create new local code systems where each root node represents a separate local code system to group the local codes under. These local codes can later be referenced in value domains and mappings. There are two types of editors: The editor for LCS and the editor for local codes (right side of the screenshot). Please refer to the Editing and Authoring section for more information about the editing local codes. The following sections discuss browsing LCS, for information about editing LCS please refer to the respective chapter in the user guide. The LCS view uses the same functions as the other concept navigators in Snow Owl: You can use the text field to do filter searches, display filter results hierarchically or as a flat list, link with the open editor, set a concept as the root node, and return to the default root node, etc. Please refer to the section about the SNOMED CT view for more details. The LCS parents view displays the hierarchy in reverse order. 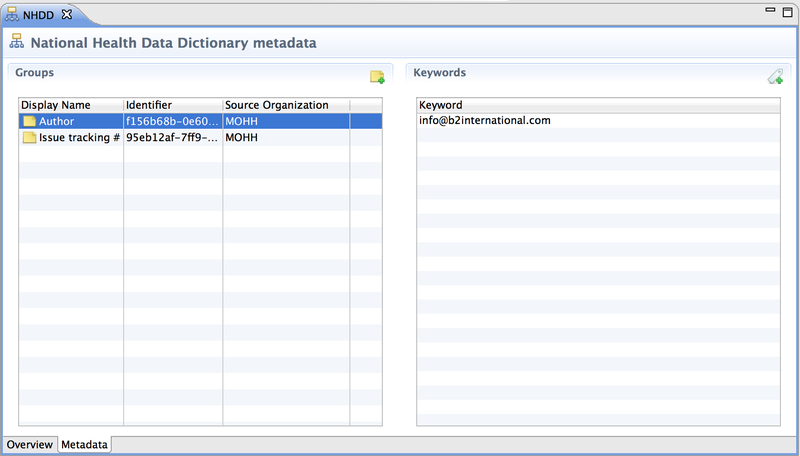 The editor for LCS consists of the Overview tab and the Metadata tab. Name: The name of the Local Code System. Short Name: This is the display name used in the view. Code System ID: A string identifying the specific version of the LCS. Description: Information describing the LCS. Maintaining organization link: Source of the LCS, identifying the originator or publisher of the information. Comments: Additional information about the LCS can be entered here. The local code editor opens when double-clicking on a local code. It consists of three tabs: Overview, Mappings, Value domain membership. Code: Unique identifier, this can be digits, or letters or any combination. Term: The associated name of the local code. 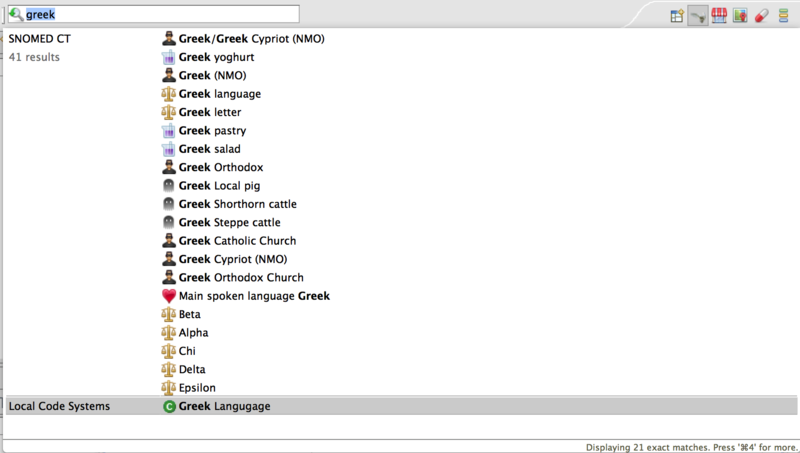 Alternative terms: Terms with the same meaning can be added by clicking on the Add new term button. Reference set type: Name of the mapping set. Status: If the membership is active. Effective time: Publication date of the membership. Value domain: Name of the value domain. Term: Name of the local code. Member effective time: Publication date of the membership. Code system ID: Unique identifier of the LCS. Searching for local codes works similar to searching within other terminologies. 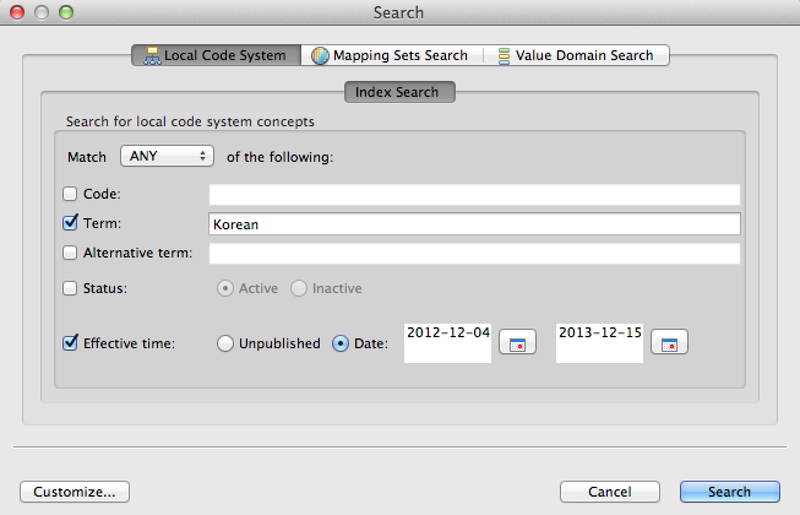 Search results for local code systems (LCS) or local codes appear as a separate category. Local code systems are indicated by an icon, local codes by a icon. The view allows to filter for Local Code Systems and local codes. Effective time: Use the calendar icon to specify a time range by entering start (left box) and end date (right box). If you enter a date only in the left box, the time range will extend from this date into the future. If you enter a date only in the right box, the time range will extend (from the past) up to this date. You can also search for unpublished Local Code Systems. Search results are displayed in the search view.